(P2) While previous research had suggested the structures predated the arrival of modern humans in Europe around 45,000 years ago, the AP reports the notion that Neanderthals could have made them didn’t fit long-held assumptions that these early humans were incapable of the kind of complex behavior necessary to work underground. 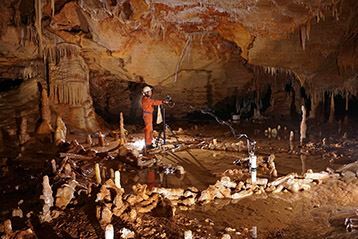 “Their presence at [1,102 feet] from the entrance of the cave indicates that humans from this period had already mastered the underground environment, which can be considered a major step in human modernity,” the researchers concluded in a study published online Wednesday in the journal Nature. The authors said the purpose of the oval structures—measuring 172 square feet and 25 square feet—is still a matter of speculation, though they may have served some symbolic or ritual purpose. Would you travel into a cave alone? Why or why not? Would you like to live in a cave? Why or why not? Why do you think people lived in caves? What’s the name of this underground area that was unknown for many years? The oval designs were probably used for what 2 functions?